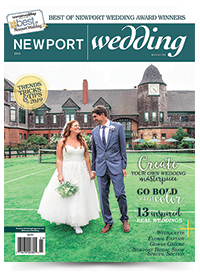 Newport is home to great invitation designers and suppliers of guest books. These businesses will help you find the invitation best suited for you. These invitation and monogram designers break the mold when it comes to announcing your big day. You'll find the best designs for a wide range of personalities, so you can invite your friends and family with style. Tip: From paper to letterpress to color, there are many variations for invitations, so give it thought. The invitation and monogram is a declaration from you and your husband, their first public display.